Today I welcome author Phyllis Entis back to Reade and Write. Phyllis has penned both fiction and non-fiction, but it’s the fiction she’s talking about today. 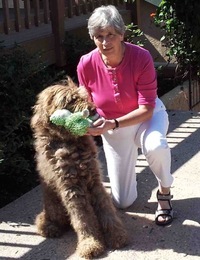 Phyllis is the author of the Damien Dickens Mysteries, which consist of The Green Pearl Caper, The White Russian Caper, The Chocolate Labradoodle Caper, and now, The Gold Dragon Caper. I can personally attest to how good the books are! She’s here to tell us a little about The Gold Dragon Caper. The hard part of the project was its emotional content. I literally wrote some of this book with tears in my eyes. The Gold Dragon Caper is a darker story than the first three novels. It was difficult to avoid the influence of the political climate in the USA during its writing, especially as Derek J. Turpin shares some characteristics with another DJT. I don’t want to reveal any spoilers, so let me just say that we learn more about what makes Millie tick in this Caper. She went through some tough times before she met Damien, and some of that comes back to haunt her in this story. Phyllis’s debut novel, The Green Pearl Caper, was a Library Journal SELF-e Selection. Phyllis is a free-lance writer and retired food safety microbiologist with degrees from McGill University and the University of Toronto. In 2007, ASM Press published her non-fiction book, Food Safety: Old Habits, New Perspectives. Phyllis lives in Carmel-by-the-Sea, California, with her husband and their Australian Cobberdog, Shalom. When she’s not writing, Phyllis usually can be found walking around town, browsing in the local library, or enjoying her garden. 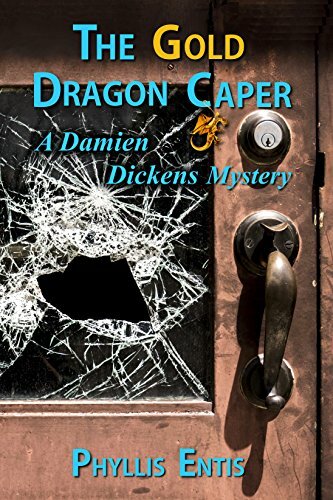 This entry was posted in Author Spotlight and tagged Atlantic City mysteries, Damien Dickens Mysteries, Phyllis Entis, The Gold Dragon Caper. This sounds like an intriguing book. I don’t generally read series but will often pick a book or two to read if they can be read as stand-alone. I’m wondering if this is the case with this series. I think this series is similar to many other series in that the mystery is good as a standalone, but the relationships between the main characters change and evolve over the course of several books. It depends, I suppose, on whether that secondary plot is important enough for you to read the series from the beginning, or if you are fine just going with the flow and accepting the relationships where they are in each book. I’ve read the Hamish Macbeth series by M.C. Beaton out of order, and I don’t have any trouble figuring out what the status of the relationship between Hamish and Priscilla in any particular book–they’re still really good! I’m two in with this series and have the other two in my TBR list – love the nostalgia feel to the stories as well as the characters. Millie is girl power personified 🙂 Always a treat to read. Just saw this comment today! I’m also two into the series and I love Millie. I’m eager to read more–sounds like her character develops a lot in this latest installment. Thanks for stopping by! Thanks for the reblog, Don! Have a great day. Sounds like a great series and everyone here is speaking so well of it. Good for you! Thanks for stopping by, Linda. It is a great series, and I recommend it. Thank you, Amy, for inviting me to visit with you this week. And thanks, also to Sharon and Maggie for stopping by. Phyllis, your latest sounds most intriguing, especially the emotional aspects. Looking forward to reading it. I need to read the book asap–it does sound like a bit of a departure from the other books, and I look forward to seeing how Phyllis does it! Thanks for visiting today! I really like Millie-I’m eager to see what Phyllis does to make us angry with Millie! You have a great week, too!